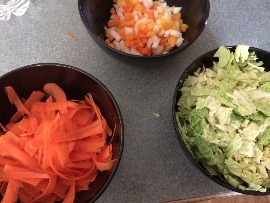 Peel, slice and dice vegetables and separate into different bowls (peppers, onions and garlic, carrots and cabbage). Saute the peppers, onion and garlic in grapeseed oil until translucent (2-4 minutes). Add carrots until soft (another 2 - 4 minutes). 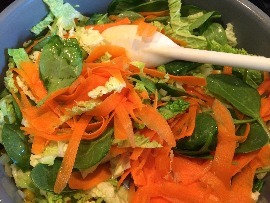 Then finally, add the cabbage and spinach until wilted and tender (you guessed it, 2 - 4 minutes). Remove from heat and save for plating. Combine all the ingredients for the miso broth together and bring to a simmer. Make sure to taste test as it cooks to custom the taste to your liking. If broth is too salty for you, add more water. If you want sweeter, add more brown sugar. 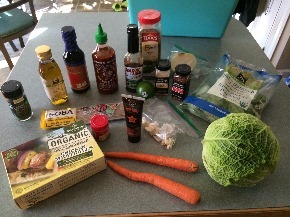 If you would like more heat, add some siracha or if you want some more acidity, add some lime juice. Just keep tasting! While broth simmers, heat Bilinski's Organic Pineapple Teriyaki Chicken Meatballs in the oven as directed. 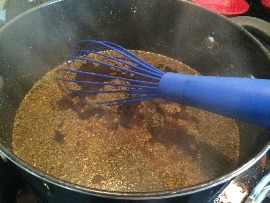 The pineapple and green bell pepper flavor are going to add wonderful flavor to your miso broth. 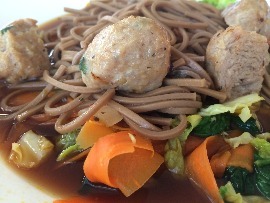 Also cook your soba noodles as directed on the packaging. 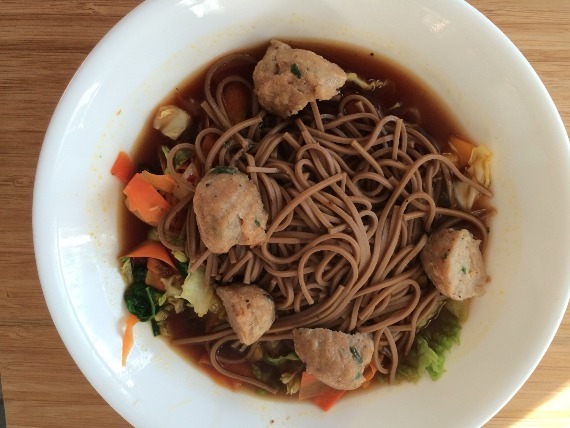 Once soba noodles have cooked, add them to your broth. To assemble your Miso Broth and Chicken Meatball Bowl, first scoop a generous spoonful of veggies into a bowl. Then ladle the miso broth and soba noodles over the vegetables and finally top with Bilinski's Pineapple Teriyaki Chicken Meatballs. This all started when I went with my folks to Panera after church one Sunday. My dad ordered their new miso chicken broth bowl and insisted I try some. It warms you up on the inside, let me tell you. Its sweet, salty and savory.....UNAMI! I decided I must replicate this at home. 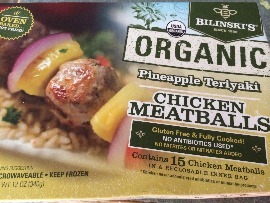 Now I am not a fan of mushrooms, so they had to be eliminated and instead of regular 'ole sliced chicken, I decided to add even more flavor with Bilinski's delicious pineapple teriyaki chicken meatballs. 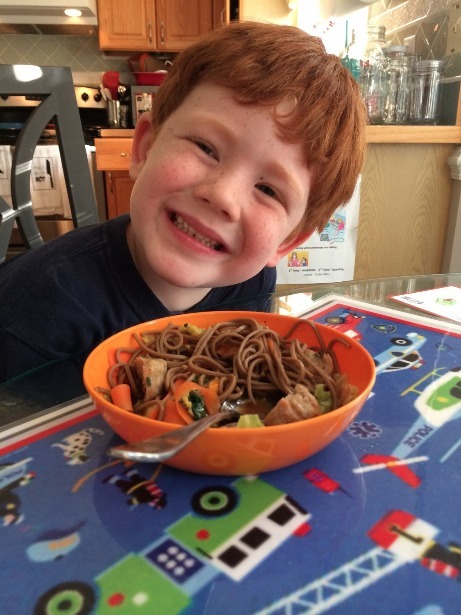 The result was a warm asian twist on the traditional chicken noodle soup. It was also slightly reminiscent of a matzah ball soup because of the large meatball texture, which who doesn't love a delicious meatball. Tis the season for soup people, and need a way to warm your insides but looking for a new and exciting twist? You guessed it, where there's a meal, there's a way! Note: While eating this meal, Tucker learned that he likes cabbage. He also learned he DOES NOT like carrots ribbon cut.